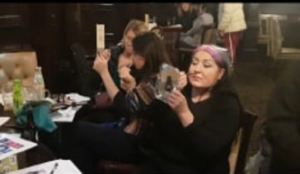 A workshop catering to a growing group of women known as ‘drag kings’ has made its debut at Liverpool’s Lisbon Pub. Sunday’s two-hour event, which was attended by 10 kings, featured a number of lessons in drag basics, including costume and makeup demos, persona creation tips and a lesson on the history of male impersonation. The aim of the Club Orientations workshop is to welcome those who are already in the drag king scene and those who are just starting out, to a safe and secure space where they can fully express themselves and explore their inner maleness. This can be achieved through costume, body language, psychology, and performance. Group organiser, Sebastian Amore, wants to encourage women from all backgrounds to discover their alter ego and express themselves openly. He said: “I’ve always been in to drag and admired beautiful guys. I think patriarchy can empower women and I think that when you step into a more masculine persona it can be very healing for women. Until now there have been a limited platforms for women in Liverpool who want to dress in male drag and some say they have felt ostracised from the drag community. Workshop leader, 25-year-old Richard Missing, added: “I’m really hoping to get more kings in Liverpool as I feel like that’s what we’re lacking in the city. I’ve always felt like I have a man within me that wants to get out. The workshop attracted women from other areas of the UK where the scene is yet to take off. 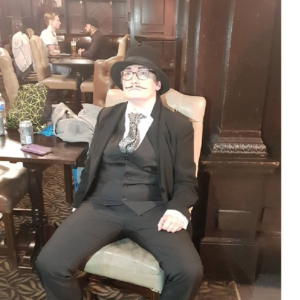 First time drag king, ‘Buster Balls’, who travelled from Nottingham to attend the event told JMU Journalism: “I’m a romantic asexual and people often try to work me out and they can’t. “I do identify as female but I’m not a girly girl and I’m not very feminine and I decided I wanted to embrace that.